I've been posting my NFL concepts for a few months, but I've been doing them just one at a time. I've gotten some nice feedback (thanks) but a single concepts they do seem to disappear rather quickly. I've decided to gather them altogether, along with a few new ones (like the following Cowboy concept), which seems to be the preferred way most of us do this. As always, let me know what you think. They were evicted from the NFC East for being so bad, they now play basketball under the pseudonym "Washington Generals". I like the Cowboys. My only suggestion would be to try incorporating the star a little more prominently. 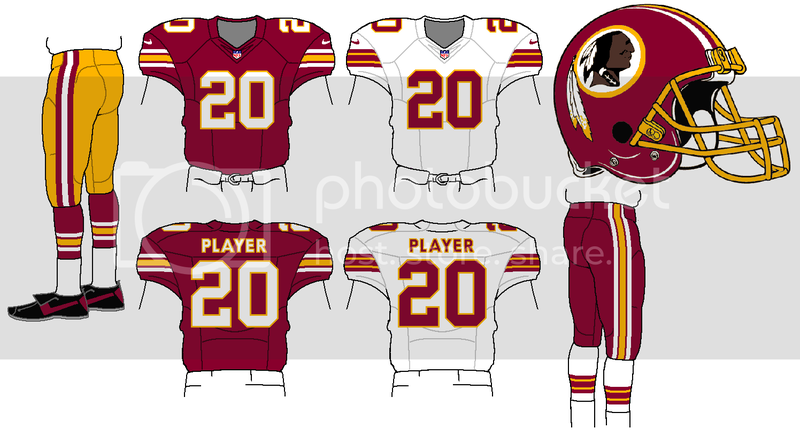 The Redskins look nice too, though there would probably be riots if they ever tried to wear this. Interestingly enough, this color scheme is similar to something I thought up for the Broncos. My only suggestion would be to ditch the bright red pants and make the top highlight on the spear yellow instead of white. The Eagles uniforms are a huge upgrade from what they currently wear. I think I'd get rid of the yellow beak (maybe make it silver instead) because it just seems a little out of place to me. 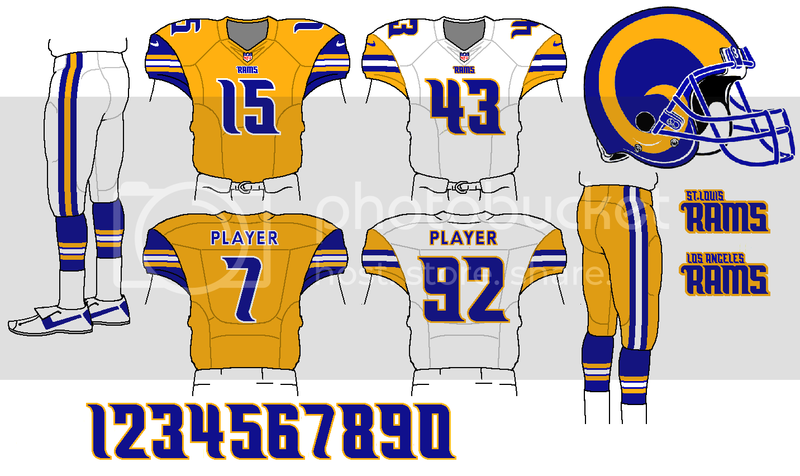 Maybe also try incorporating a thin white outline around the numbers on the home jerseys. I'm really looking forward to seeing the rest of the teams. Washington reminds me of a WFL uniform. I'll never get why so many people want to see the Cowboys in navy, full time. Navy and silver is a color scheme I feel like I've seen a million times. Their old scheme of dark royal blue and metallic blue-silver? Unique. Yeah, when I first posted that, I said it was a little out there. If someone somehow handed me the magic wand, I doubt this is the Skins uniform I'd actually go with. I like the skins uniforms. I do think they could use a paler shade of yellow though. Love the Eagles and the Cowboys are an upgrade, but the bright red on the Redskins really doesn't work, especially with keeping the burgundy. The red pants hurt my eyes. "2 outta 3 ain't bad". I like the direction for the eagles. Kelly and gray is a great, underrated scheme. For the helmet, I'd go closer to the old wing...more gray, less green/white. Is it just me or are the numbers on the green jersey a bit too large? 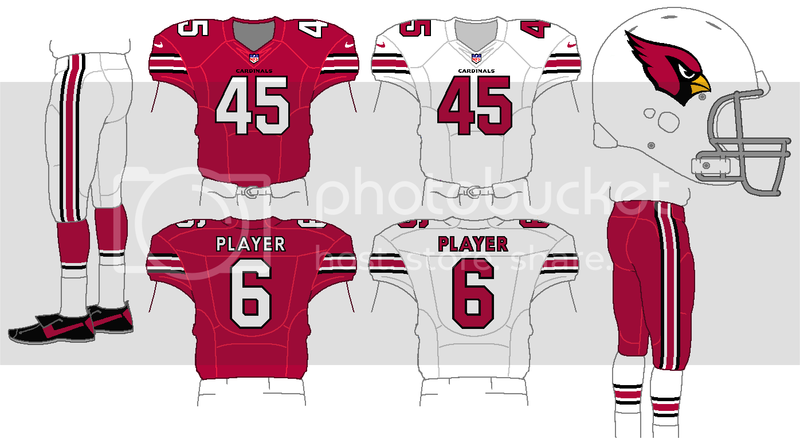 In any case, I think that jersey could use white outlines on the numbers. 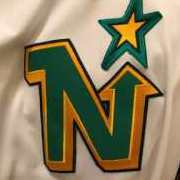 I am a sleeve logo fan, but I think the yellow beak just sticks out too much here. 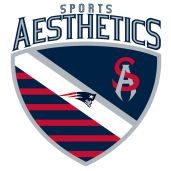 I'd rather see that toned down (to gray, I guess) or the logo removed in favor of some kind of stripes. This really makes me hope that sometime the Eagles realize that their uniforms are overdone and dated. Dallas looks good. And should they decide to go with one shade of blue, this is a good choice. I am not liking the mix of colors with Washington. The Skins has a Va Tech feel with the orange added. Eagles update. I've darkened the green slightly, changed the home number from solid gray to white w/ gray stroke, and darkened the gold beak. Adding Cardinals. This is one I've had floating around for a while and kept thinking it was too obvious. But then I though, maybe its obvious for a good reason. 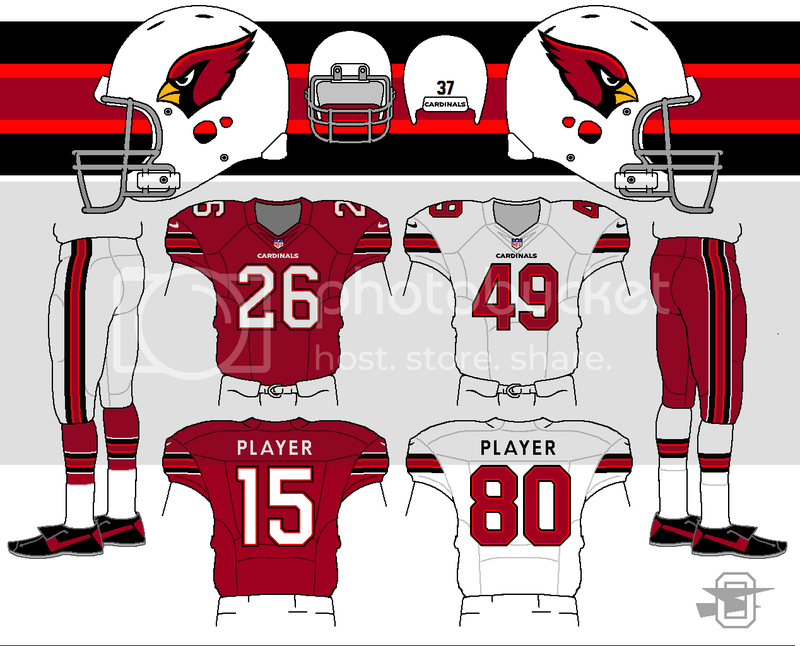 My favorites are the Cowboys, Cardinals, and Eagles. Would especially love to see the Eagles in that shade of green, and it would be great to see the Cowboys get rid of the hideous extra stripe around the numbers on the blue jerseys. Well, that's just one of many things wrong with the current Cowboys uniforms, but you've addressed them all. That's kinda true, which is a weird thought. My guess would be that, for the most part through the years, Louisville was following the NFL Cardinals looks, not the other way around. That is probably why I was hating this concept...you know because I despise U of L.
Another Washington concept. I based this on the idea that the helmet was untouchable, and built a uniform from there. That isn't a belief I personally hold, but I know others do.